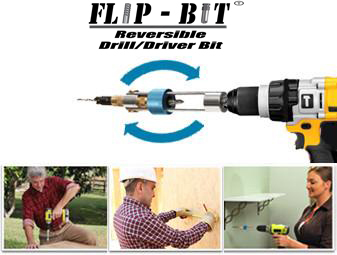 Flip-Bit, Reversible Power Drill/Driver Bit Set - Tools & more! This clever bit allows you to switch back and forth from drilling to driving, in just seconds! Simply drill your hole, and then flip the bit over to the driving screwbit by swiveling the "Flip-Bit". No need to stop in the middle of a project just to change bits. Tear through household projects and tasks quickly and easily. Never fumble around replacing drivers and drill bits in the middle of a job again! Click the button below to add the Flip-Bit, Reversible Power Drill/Driver Bit Set to your wish list.